Can't believe it is already 5 months since the Spring Knitting and Stitching Show in Olympia London, I had such a great time there, seeing all the tools and fabric for sale, attending classes and of course splashing some cash on a new sewing machine. Read my show review here. And now it's time to think about the Autumn show in Alexandra Palace. 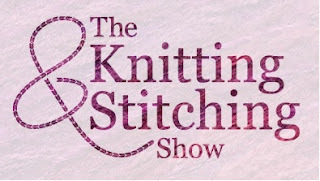 Tickets are already on sale for The Knitting and Stitching Show - 10th-13th October. I'm looking forward to attending the event and will be booking myself into some classes again, think it's the best way to get the most of the day - learning something new and meeting new people. There is an amazing range of classes again at this event including 3D Applique, Making Felt Lace, Knitting Baby Booties, Stitch Portraits, Freeform Crochet. My biggest challenge is trying to decide which day to go on and which classes to attend. I can't wait, it's my favourite day out of the year!